1. 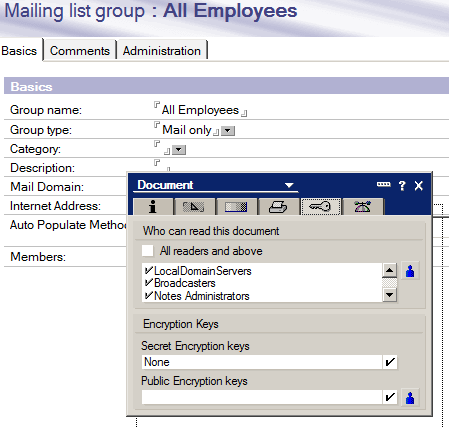 Before updating your broadcast group, create a group that will be used to define who is allowed to send mail using the broadcast group. Add the appropriate members to the group. In many cases this group will be maintained by HR or some other person responsible for authorizing broadcast messages. 2. Edit the group used for broadcast messages. 3. Display the document properties of the mass mailing group. One way to do this is press Alt-Enter, then change the object to Document. 6. Add the group created in step 1 to the list of readers. IMPORTANT: You MUST also add LocalDomainServers as well as your administrator group or you will not be able to view this group document once you save it. 7. Save and close the group. Now only people listed in those groups can send email to the broadcast group. NO messages received via SMTP will be able to use the group because they are treated as anonymous.